Architectural record book created by nationally renowned architect Robert Mills in 1807 is believed to be among the oldest surviving plans for any building in Georgia. Augusta, GA– The Georgia Heritage Room of the Augusta-Richmond County Public Library System is pleased to announce the availability of Designs for Augusta Church, State of Georgia by Robert Mills of South Carolina, Architect, Philadelphia, 22 July 1807 at https://dlg.usg.edu/collection/fpcag_rmfpc. 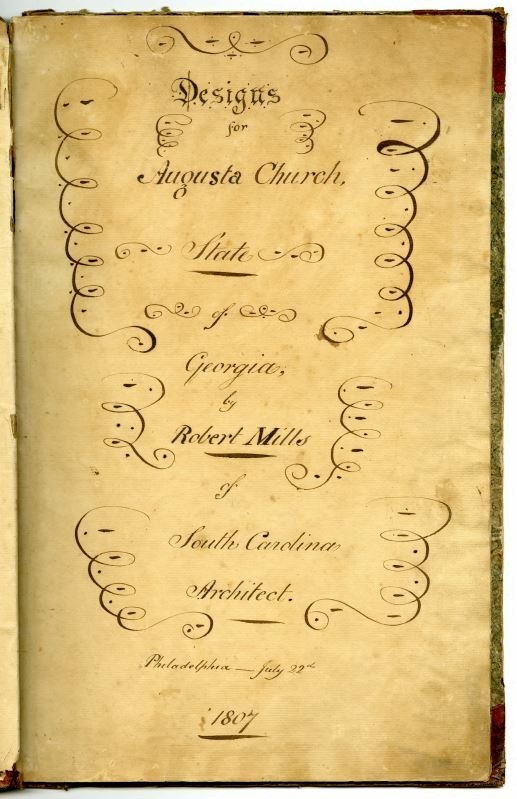 The collection consists of an architectural record book belonging to First Presbyterian Church of Augusta, Georgia, and created by nationally renowned architect Robert Mills in July 1807. Mills executed the three-part record at the behest of the building committee, and in it details plans for the design of the future church. Support for this project provided by the Augusta-Richmond County Public Library System and Georgia HomePLACE, a unit of the Georgia Public Library Service. Robert Mills is known, among his many projects, for the design of the Washington Monument. A prolific architect and engineer, Mills began his studies in Charleston, but as a young man moved to Philadelphia, and apprenticed under James Hoban, designer of the White House, a project to which Mills contributed. He also studied under famed architect and engineer of the period, Benjamin Henry Latrobe, and fell under the tutelage of Thomas Jefferson who designed and built Monticello, his home in Charlottesville, Virginia. Throughout his life, Robert Mills designed numerous buildings throughout the Mid-Atlantic, including official appointments by President Andrew Jackson in 1836 to design office complexes for the U.S. Treasury and the Patent Office. Mills was also an accomplished author, having published Mills’ Atlas of South Carolina in 1825. Design for First Presbyterian Church in Augusta, Georgia (1807) was accomplished early in his career, during a time when he received commissions to build other churches, notably the Circular Congregational Church in Charleston, South Carolina. Classical Revival architecture predominated during the mid-eighteenth century onward, heavily influencing Mills and his contemporaries. This style is reflected in his plans for First Presbyterian Church. Though the building has undergone significant remodels over the years, it retains its original classical form. The Augusta-Richmond County Public Library System (ARCPLS) serves more than 250,000 county residents. As a member of Public Information Network for Electronic Services (PINES), a program of the Georgia Public Library Service, ARCPLS provides access to over 10 million books. ARCPLS facilitates programs and classes to educate and entertain all ages at no cost. In addition to being a vital meeting place where the community can gather, explore new worlds, and share ideas and values, ARCPLS is a community hub and a critical anchor for our residents and neighbors. With a committed and diverse staff, ARCPLS continues to bring innovative and adaptive information and technology to its patrons. Visit ARCPLS at https://arcpls.org/. Georgia HomePLACE encourages public libraries and related institutions to participate in the Digital Library of Georgia. 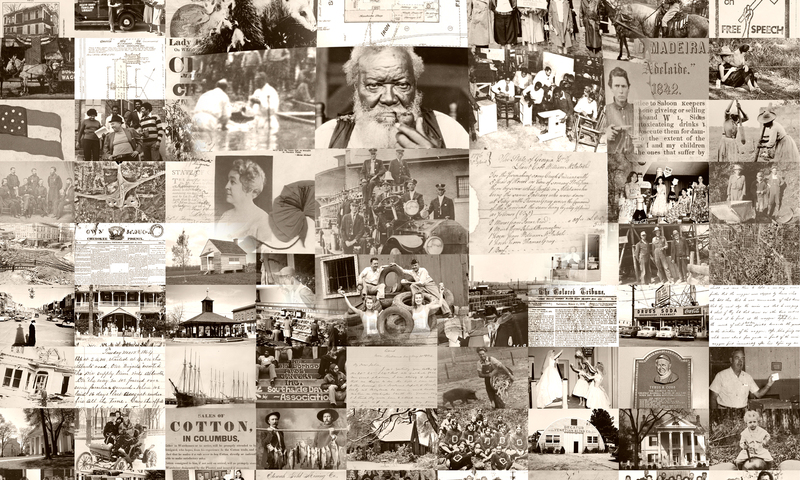 HomePLACE offers a highly collaborative model for digitizing primary source collections related to local history and genealogy. HomePLACE is supported with Federal LSTA funds administered by the Institute of Museum and Library Services through the Georgia Public Library Service, a unit of the Board of Regents of the University System of Georgia. Learn more at http://www.georgialibraries.org/homeplace. First Presbyterian Church was established in 1804. These 1807 drawings by Robert Mills were used to guide the construction of the sanctuary, which was completed in 1812. It has been occupied continuously since that time. During the Civil War, the sanctuary was converted to a hospital and used for wounded soldiers. The church celebrated her bicentennial in 2012. Located in historic downtown Augusta, the church seeks to restore people and rebuild places through the gospel of Jesus Christ to the glory of God.